Need to know the size of a particular file? Or have you ever wondered how large a particular folder is on a Mac? 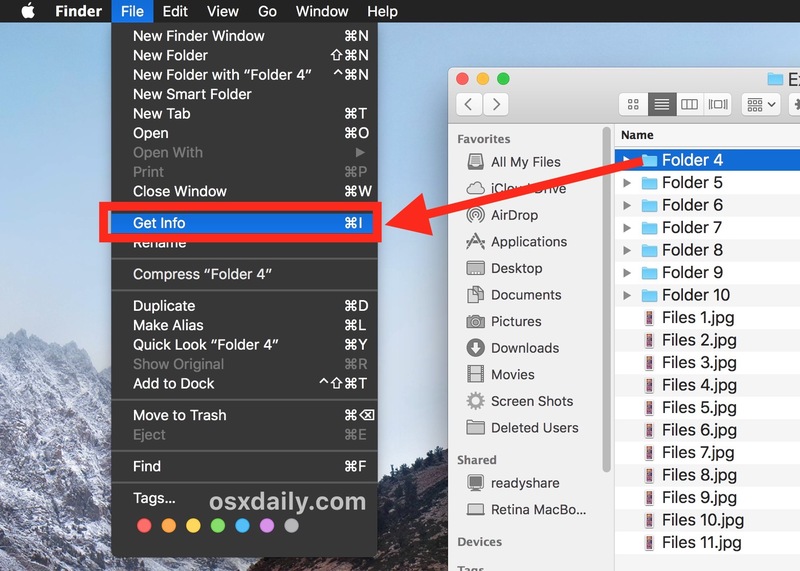 With a simple trick you an quickly get the size of any file, folder, or item as found within the Finder file system of Mac OS. 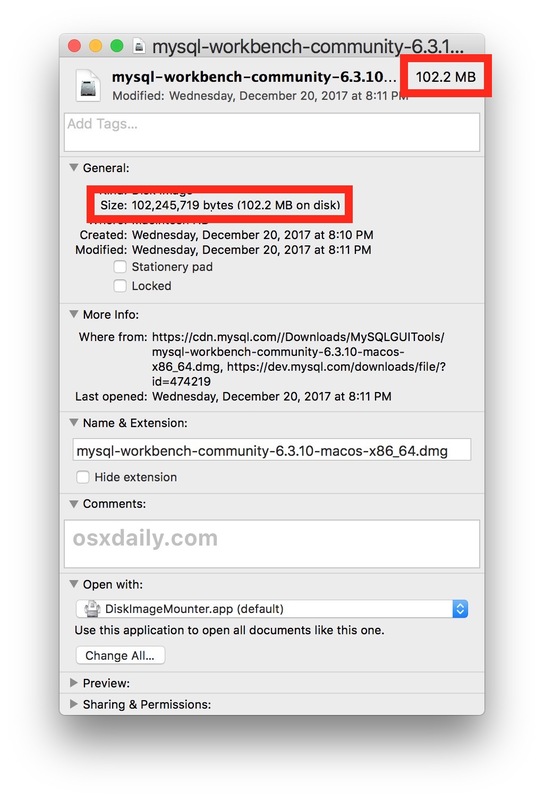 This tutorial will walk through using the Get Info panel in Mac OS to be able to quickly discover the storage size of any given file or folder on a Mac. You can access the Get Info panel through a menu item, or a keyboard shortcut. The tricks work the same on all versions of Mac OS and Mac OS X, as the Get Info capability has been around on the Mac since the Classic era. You can close the Get Info window when finished reviewing the data. The Get Info panel reveals a lot of other helpful as well, including creation and modification date, tagging information, file comments, file origin, file locking, sharing and file permissions, what app the file opens with, and more. Regardless of how you access the Get Info panel, the results are the same. You can also access the Get Info panel of a file or folder result returned via the search feature Spotlight. You can also see the file size of a Finder item when the active directory is in the List view. If you’re the type of person who likes to see as much information as possible at a glance, you’ll likely appreciate always showing folder sizes in Mac OS, and you might also want to enable the Show Item Info option for the Mac Desktop and Finder as well, which will reveal additional information for files and folders shown in the standard Icon view. It’s worth mentioning that this is not the only way to reveal the size of files and folders in Mac OS. 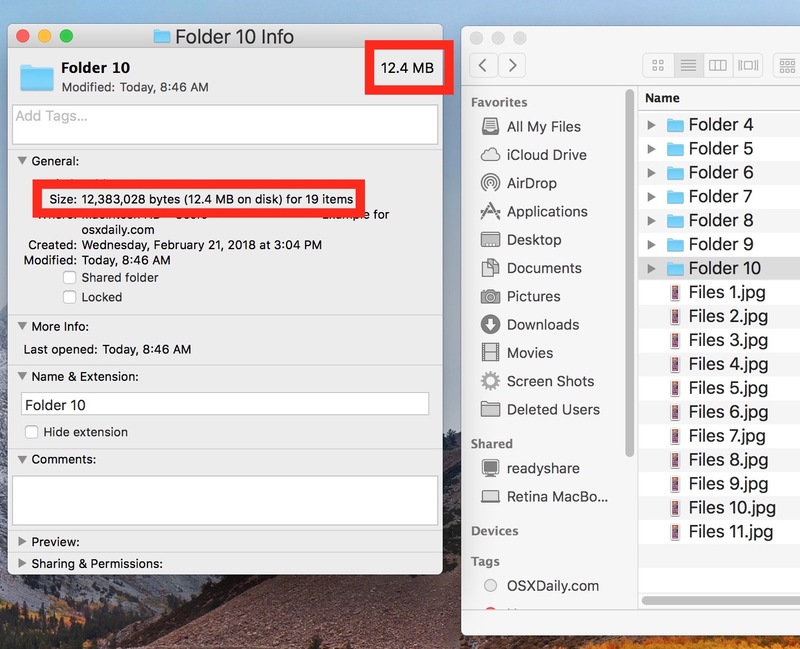 You can also use a setting to calculate and reveal folders sizes in List view, or you can find large files and folders on a Mac by using the Finder Search feature to narrow down items within the file system based on their size. And of course there are a variety of third party disk space analyzers that also make it extremely easy to locate folders and items based on file size, which can be handy tools for tracking down disk storage hogs. And of course you can also turn to Terminal and get the size of a directory from the command line or a file that way as well. I am accustomed to using “Get Info” for finding file and folder size information on Mac. BUT, I just learned… if you want the size of a folder… you can also select a folder and then hit SPACEBAR to open Quick Look and that shows you the folder size info too. This is interesting because Quick Look on a file will try to ‘preview’ the file, which is how I always used it in the past, I had never tried it on a folder before with any recollection anyway. If you want to know the filesize of a series of files/folders, Command + Control +i is also very handy. Just select the folder and press the space bar. Just click on file or folder and the size will be shown on the image that comes up. Eh, how about select folder(s) and press space. Quick look gives you size. nother in a long, long list of long, overcomplicated ways to do simple shortcuts. Select item the info is desired on then command I. End of story. Some of the fanboys on here need to take a breath. This article covers multiple options for accomplishing the same task, so that users can develop their own preferences. Additionally, the article seems rather geared towards a newer Mac user, most likely a PC convert, who will not have the level of “common knowledge” with MacOS that they will with a PC running Winblows. In other words, the article isn’t written for you. IOW if you’re an idiot, this article is for you. The drop down shows the shortcut, which is the simplest, fastest way to get the information. Only an idiot would want to do more than that.